The Center for Resilient Cities (CRC) is expanding its healthy food access programs to include fruit trees that can thrive in changing hardiness zones as well as raised garden bed structures to assist in soil conservation, weed and pest control, and water retention. The existing community gardens serve over a dozen families of multiple generations, while four 40’ x 40’ garden plots act as educational spaces for 100 Badger Rock Middle School students. With demand growing for increased access to local agriculture and community garden space at Badger Rock, the expansion will help CRC reach more community members and continue to build a resilient local food system in an area facing increased healthy food access challenges. CRC is working toward creating a sustainable, resilient community in South Madison, Wisconsin. Based on neighborhood input and community needs, the Badger Rock Center was established to serve as a neighborhood center, including a public charter middle school, in a facility built to U.S. Green Building Council LEED (Leadership in Energy and Environmental Design) Platinum standards. The neighborhood is considered a healthy food access priority area by the City of Madison with only a gas station convenience store and sub shop in close proximity to homes. In the 2017–18 school year, the middle school served 86 students with 78% from low-income families, 36% having special needs and 32% being English language learners. The work at Badger Rock includes a robust urban agriculture program, which grows food year-round and is integrated into the middle school curriculum as well as community gardening, a weekly farm stand, and monthly community meals held at the Center. Climate change in Wisconsin provides both opportunities and threats to farms and gardens. An extended growing season may increase agricultural production of certain cold-weather crops, but overall threats include increased soil erosion and flooding from more frequent and heavier rain events, plant stress from periods of drought, and the overwintering and encroachment of new weed and pest species. In addition, plant hardiness zones—areas of similar climatic conditions where specific plant species thrive—are shifting northward due to warming temperatures, causing some species to disappear from their historic ranges and altering ecosystems. The USDA Plant Hardiness Zone Map displays distinct planting zones separated by 10°F difference in average annual minimal temperature per zone. In 1990, the USDA Plant Hardiness Map showed south-central Wisconsin, including Madison, in Zone 4b (annual minimum temperature of -20°F). As of the 2012 map revision, south-central Wisconsin has moved into Zone 5a (annual minimum temperature of -15°F). Resilient food systems are a universal need in the face of climate change, yet areas such as South Madison that are already facing healthy food access challenges are more vulnerable to anticipated problems such as food-chain supply disruption and rising costs. Since CRC works to build a long-term food system through action and education, they recognize that any sustainable community planning must include climate change. By considering changing plant hardiness zones in species selection and cultivation of fruit trees, CRC hopes to increase long-term food sources and learning experiences in the area. In addition, the purchase of materials for raised beds for the community garden expansion will take advantage of the extended growing season while alleviating stresses related to soil health, soil moisture, and weed and pest control. In this community, many families are just beginning to garden, and raised beds make the gardens more accessible and manageable to tend. Overall, the project will enhance the space as a vehicle for community resilience through increased neighborhood food security and food and climate literacy. The projected cost of the project is $2,500 based on anticipated support from the National Adaptation Forum travel offset program. CRC will expand upon existing infrastructure by building and installing new community garden beds and planting additional dwarf fruit trees around the site, such as cherry, persimmon, paw paw, and cold-hardy peach and kiwi trees, adding to the apple, pear, and plum trees, and fruiting shrubs such as aronia and red and white currants that have been planted in the past. Existing garden infrastructure includes 12 raised beds (6 metal horse troughs and 6 wooden raised beds), and underground cisterns allowing 80,000 gallons of rainwater to be collected, stored, and then distributed around the site via a system of yard hydrants. This water system helps make urban agriculture at Badger Rock better able to survive extended drought periods, as well as helping to manage stormwater. Badger Rock also has a heated greenhouse, a hoop house, and low tunnels for season extension. CRC uses a large windrow composting system for organic material such as weeds that provides most of Badger Rock’s annual compost needs. The project will begin in Spring 2019. CRC will purchase 4 horse trough garden beds, 4 raised gardens beds, and 15 fruit trees. Previous infrastructure investments relating to this resilient food system development include 12 community garden beds ($1,750 in 2018), the 40’ x 40’ food forest ($4,000 in 2018), and the hoop house ($3,500 in 2014). 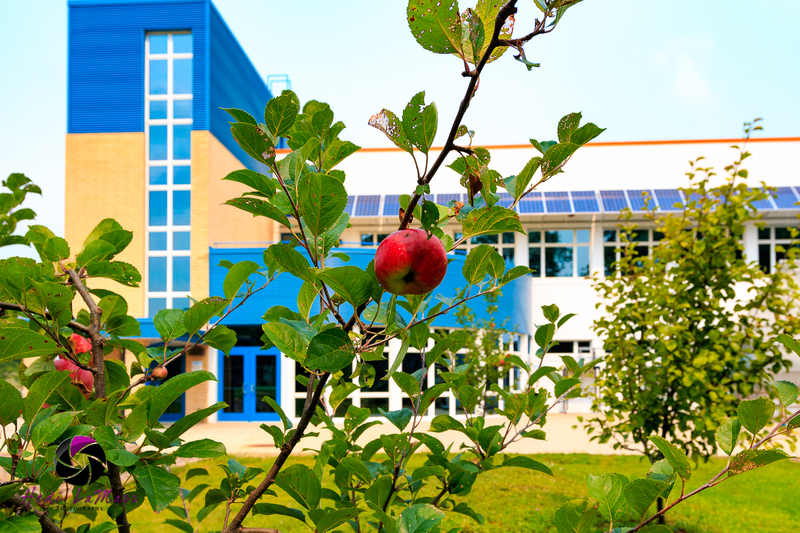 The underground cisterns and existing fruit trees were part of the original building and site construction, which totaled $7 million and was completed in August 2012. Within 5 years, larger quantities of fruit for use in community cooking classes and the school garden class, and canned or preserved by the students for sale at the Badger Rock Community Market’s farm stand. The Center for Resilient Cities is a 501(c)3 nonprofit that practices sustainable community development, working with neighbors to build communities that are good for people and good for the environment. Our process starts by asking neighbors about the values, needs and priorities of the community. Then we lend our expertise and develop partnerships to address both current and future challenges within the neighborhood. The Center for Resilient Cities (CRC) is expanding its healthy food access programs for increased access to local agriculture and community garden space at Badger Rock Center. The expansion will help CRC reach more community members and continue to build a resilient local food system in an area facing increased healthy food access challenges.